Premium Knitted Bow Ties in various colours available. Ideal for Dinner Parties, Weddings, Work and Casual Wear. Matching skinny ties are also available. Express your unique personality with one of our DQT men’s premium knitted polyester plain pre-tied bow ties ideal for the casual or formal events such as proms, dances and other special occasions. All of DQT’s Knitted Pre-tied Bow Ties have a double knit bow, rather than a single knit – one feature to help you stand out in a crown and stay ahead of the fashion pack! It’s time to upgrade your wardrobe with our knitted bow ties, add some simple touch of premium plain knitted pre-tied bow tie on those drawers. 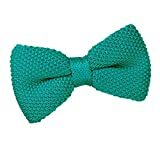 Match the colour of your everyday look with our plain knitted bow tie, there are various colours to choose from. Feel youthfully elegance to even the most stuffy business suit your knitted bow tie won’t crease, you’ll find it looks just as fresh after an early morning bus to work as the minute you put it on. DQT’s Plain Knitted pre-tied bow ties are perfect for formal and casual occasions. They are surfacing as one of the hottest bow in the fashion world. Knitted bow ties might seem like the latest fashion trend, but it wasn’t so long ago that they were part of everyday life. We stock a great selection of trendy tie alternatives; simply take a look at our products to find something that’s right for you.